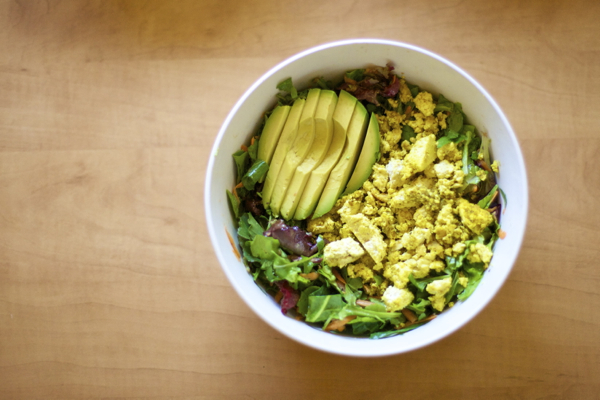 Leftover tofu scramble on a bed of mesclun, plus avocado. As I’ve worked with more and more clients as a Vegan Lifestyle Coach, I’ve noticed that certain issues come up again and again, for almost everyone I talk to. I guess it makes sense – we’re all busy people trying to do our best in sub-optimal situations, and we all struggle with similar restrictions: time, energy, and finances, versus our desire to eat healthy wholesome food. When I lived in Portland and I was a wife, I was lucky to have a lot of time to spend in the kitchen. Waits was younger so he napped more, and then in the evenings Damian would take him so that I could make us elaborate dinners. Um, life is different now. 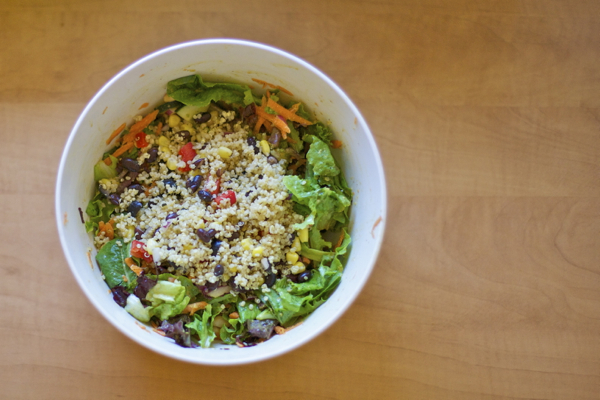 Leftover “confetti quinoa” (quinoa, black beans, sweet corn, bell peppers, and red onions) over a bed of mixed greens, plus shredded carrot. I am a busy lady. Okay, I’ve always been busy (aren’t we all? ), but these days I’m a single working mom and it feels like “busy” doesn’t even begin to describe the frantic juggling act I’m constantly undertaking. But I digress. Let’s talk about salad. 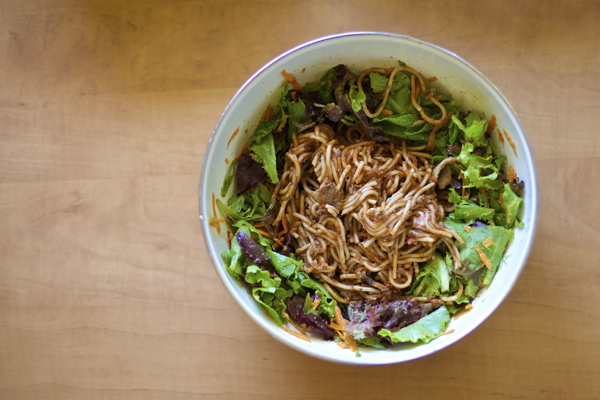 Leftover spaghetti with mushroom marinara over mesclun and shredded carrots, extra nooch. Leftover salad has become my secret weapon, my saving grace for easy healthy eating. Because I love salads, but they can take some time to prepare, what with all the chopping and toppings. And leftovers on their own are fine for lunch, but they do tend to lack in the *fresh* department. And mostly, eating greens as often as possible is the single best thing I can do to keep my body feeling fan-freakin’-tastic. So that’s what I do. I open a bag of greens, dump it into a bowl, and plop my leftovers on top. If I have time (and I usually do, because it literally takes like 2 minutes) I’ll dress the greens before adding the leftovers. My standard go-to dressing that meshes well with pretty much anything I’m putting on top, is a splash of red wine vinegar, a little drizzle of extra virgin olive oil, a clove of garlic (crushed), and a liberal sprinkling of nutritional yeast. No need to pre-mix, just throw it all on top of the lettuce and then toss it all up. I really like shredded carrots in my salads, so I often grate one up real quick (30 seconds? maybe 60?). And avocado makes everything better (another 60 seconds to slice and dice). So even with accouterments, this is like a 4 minute meal. 5 tops. And that, my friends, is a life-saver. Leftover homemade curry (with brown rice mixed in) over baby greens, straight up. If you’re looking to streamline your lunch (or dinner) while keeping things healthy and higher in fresh, raw veggies and greens, I’d urge you to give this strange creation a try. You can use almost any leftovers imaginable – stir fry, mac n cheese, lasagna, chinese takeout, homemade stew, pudla, hummus or other dips, fettucini alfredo, enchiladas, Indian curry, shepherd’s pie, and it truly just goes on and on. Endless possibilities! So what do you think? Am I crazy? Will you try it? I LOVE THIS! And I have been guilty of doing it too! Mostly because I am not creative at all with my salads (workin’ on it, though) so sometimes it’s just easier to dump the leftovers on a bed of lettuce. I already do this! Some co-workers and I hit up WF every Monday and stock our work fridge (and I mean CRAM IT FULL) of mixed greens + whatever other salad toppings we each want individually. This is how I finally got around to trying Beyond Meat, when my favorite seasoned tempeh wasn’t in stock. Whatever my family had for dinner the night before, I bring a jar of it with me to work and dump it atop a giant mixing bowl of greens, plus some extra protein (usually beans). I do it on the weekends, and sometimes at night, too. The husband has slowly followed my lead (dinner is always served up with a giant family salad during the week, and at lunch on weekends), and Nina has discovered lettuce cups. And the joy of raiding the salad bowl when she thinks I’m not looking. She thinks she’s getting off easy when I give her a tiny serving of greens at dinner, but she usually pilfers a small bowl’s worth before we even sit down to eat. Oh, and I’ve started topping almost everything with grated carrot and the like, especially cooked pasta or rice dishes. Shredded Brussels, too. I never thought biryani rice would be my stealth vehicle for getting raw veggies into the fam. I already do this, also! Busy minds think alike, it would seem. 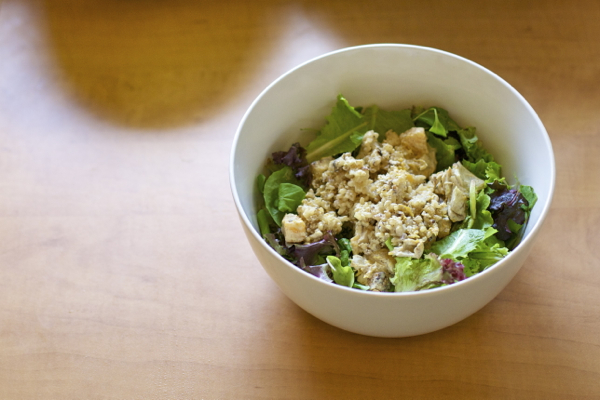 Greens make anything better in my opinion so I’m definitely down with leftovers over salad :) I really need to get a bigger salad bowl though…. I think this is a great idea. I like really weird combinations of food, so I don’t find this crazy at all! ( not that I think the combos are weird- haha) Thanks for sharing this idea. So great- and easy! Love this post…I do this all the time!!! I am so glad there is at least one other person who thinks avocado makes everything better ;-) I can put it on anything! I do this everyday :) My method is a dash of laziness, one part I love eating out of bowls, and a hint of- I refuse to waste food. Some dishes are just tastier when they’ve aged a little. My mom used to do stuff like this with leftovers and my sister and I dubbed it Mom’s Yucky Lunches. But 25 years later you know what I eat all the damn time? She knew. It’s the best! Ummm, I LOVE this idea but never thought of it!! I am a devoted eater of leftovers but this is a great way to make them healthier and stretch them further. Literally as I read this article I am eating two slices of leftover quiche for lunch (I know I know, I am totally not vegan) but I think ONE slice of quiche would have been awesome on a bowl of greens… thanks for the inspiration!!! It really does work, you stretch your leftovers PLUS you maximize your leafy green intake. It’s a win-win! Cause it’s the best, right?! Oh me too, and it’s resulted in some seeeeeriously strange concoctions. But hey, I can’t waste food! Yay, busy makes for ingenuity! Ooh shredded Brussels, now there’s an idea! It’s easy and it tastes great, so why not, right? I love leftover bowls, but I use rice, quinoa or steamed kale; for some reason I never thought of putting hot leftovers over cold greens. For lunch today I threw hot channa masala over lettuce and topped it with half an avocado: best. thing. ever. Thanks for the tip! I love leftovers salad! I started doing this shortly after I had my second baby back in March because I probably wouldn’t have time to eat otherwise! Every Sunday after our local farmer’s market visit I would put the kids down for a nap and get down to making my “base salads” in mason jars. These were typically tomatoes, cucumbers, carrots, red onion (or shallots), bell peppers, zucchini and topped with a salad mix and a wedge of lemon. I like my veggies all chopped very fine like down to the size of a corn kernel. While chopping I would cook up a grain and/or protein like quinoa, beans, barley, etc. and store in another container in the fridge. I usually made about 5 pint jars of salad and everyday I would eat it for lunch topped with beans and/or grains. Sometimes I would add salsa & tortilla chips or hummus & matzo crackers or any leftovers sitting around. Possibilities: endless. Just dump the ingredients in a giant bowl or plate and lunch was ready! After my maternity leave I have continued this tradition for taking my lunch to work. It has saved me from having to buy lunch which usually left me feeling sleepy afterwards anyway. These look delicious! I can’t wait to try them! I am always looking for ways to get more greens into my diet and this looks like a wonderful way to do so! Thanks for sharing!